Which we use to invest in talented, independent winemakers. Which we pass back to our Angels so everyone wins! We don't just sell wines, we make them happen. Since launching in 2012, Angels have helped us invest over $30m in more than 40 winemakers. By committing early and financing the same growers year after year, they can focus on growing quality grapes rather than volume. We can give nature the time she needs to turn the grape juice into delicious wines, rather than hurry the process with artificial enzymes. Because our growers know that their fruit has been sold upfront, they harvest at the perfect time for ripeness. Because we buy barrels, bottles, corks and labels for tens of thousands of cases we get economies of scale that small winemakers don't. We squeeze less juice from the grape so that we get all the fruit and less of the bitter dregs that make cheap wines that cheap. Because we deliver directly to you, you don't pay for middlemen. Our winemakers get to sell all of their wines, and make a living. We make the same margins as everyone else, and have a lot of fun along the way. And as a wine drinker, for the $40 a month you probably would have spent on wine anyway, you get wholesale prices. You can be sure that all our wines have been lovingly made by a talented winemaker and stripped of all the costs that add nothing to the flavour or quality of the juice in the bottle. 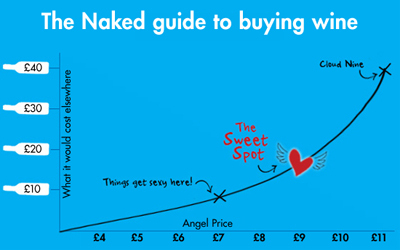 "Customers of Naked Wines want more than simply bargains and a decent bottle." "NAKED WINES said it will pour £70m of funding into its independent winemakers this year after enjoying a bumper Christmas and growing its community of angel investors." "Naked Wines has pledged to pump £70 million into winemakers this year after reporting a 40 per cent rise in sales over Christmas." Your money back if you're not totally satisfied with the wines. 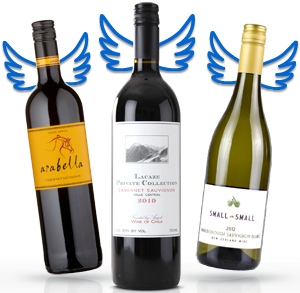 Join the Angel waiting list today and change a winemaker's life while getting great wines at affordable prices.